Still catching up on posting…these are from a few months back when I knew I was leaving Cahill and started scaling back on work to take some off-campus lunches and catch up with old friends I hadn’t seen in a long time. Dinner at Untitled at the Whitney. 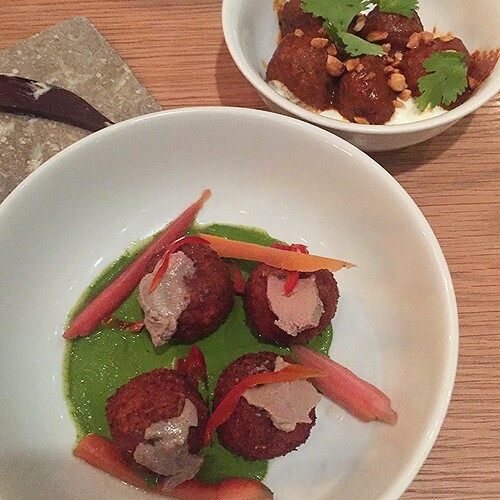 We started off with Carolina rice fritters that came smeared with chicken liver and pickled carrots and lamb meatballs with peanuts and guajillo pepper. A super fancy, farm-to-table version of bar snacks. 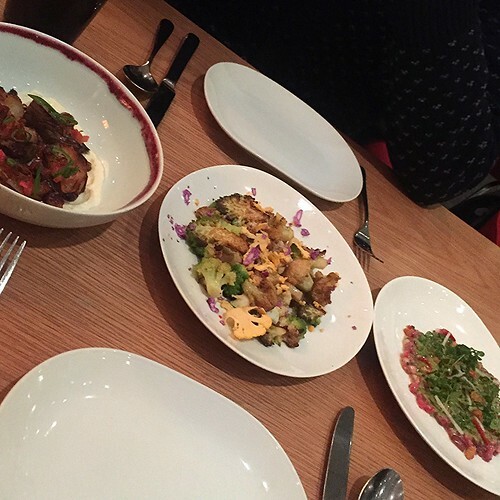 Instead of ordering heavier main dishes, we shared the beef tartare with chestnuts and winter squash; cauliflower, cardamom custard and lemon; and sunchokes with bacon and cloumage cheese, which was my favorite of the three. 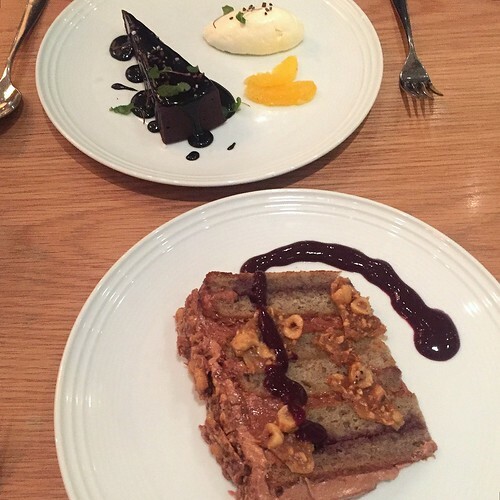 And because we’d decided not to drink any booze, we justified ordering two desserts – the hot fudge truffle cake with creme fraiche which I could only handle two bites of, it was so rich, and the ridiculous, giant banana hazelnut praline cake with concord grape sauce. Not bad for a weeknight meal. I also got lunch with Bert and Artemis at Tribeca favorite, Little Park, conveniently located right outside the Chambers Street subway stop. 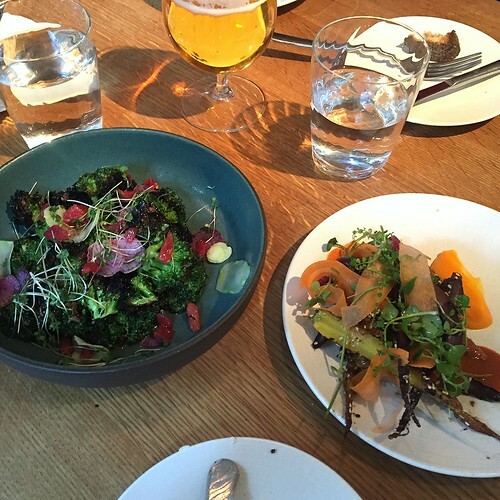 Here are the charred broccoli with radish, blood orange and pancetta with the roasted carrots with sesame, dukkah and honey. I normally don’t really care for carrots but this was an interesting sweet and savory take thanks to the dukkah, which I’d never really tasted, and honey. 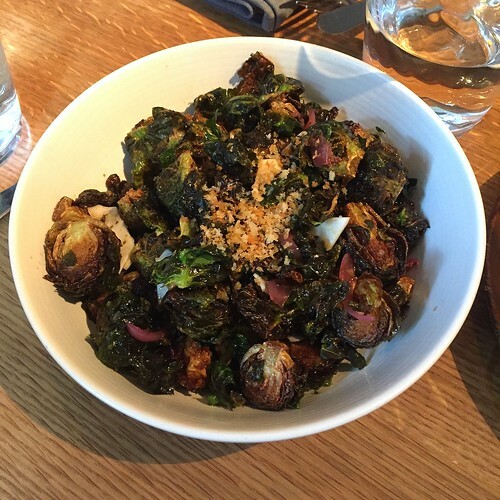 A favorite dish from a previous visit – the crispy brussels sprouts with parsnip and apple cider. These taste a lot like the sprouts from Rouge et Blanc…mainly in that they’re both hella fried and have a nice acidic bite to them. I could eat bowls and bowls of these no problem. 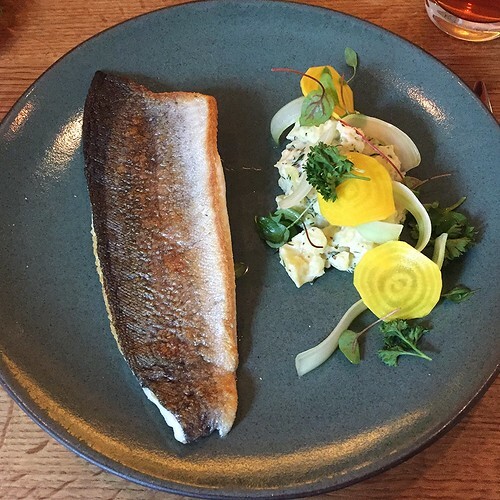 My main of rainbow trout, fingerling potato, dill and celery. A nice, light take on the fish salad combination. Which was good considering I was meeting up with old high school friends at Khe-Yo later that evening. Aforementioned dinner with Lucy and Steph at Khe-Yo, also in Tribeca, although a totally different cuisine. 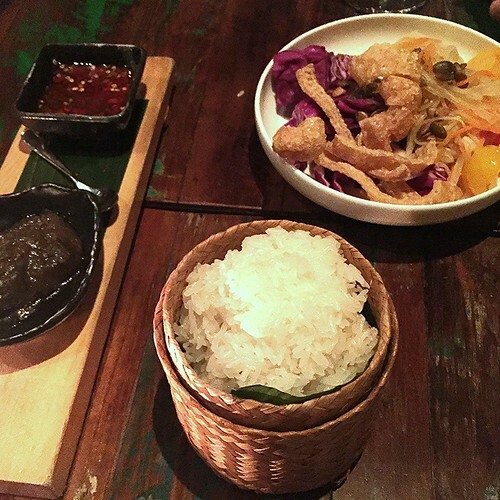 It was one of the few times I’d ever had Laotian and man, is it addictive (and spicy). Here is the smashed green papaya salad with fried pork rinds on top and their two famous sauces (one of which basically just singes all your tastebuds off if you’re not careful). 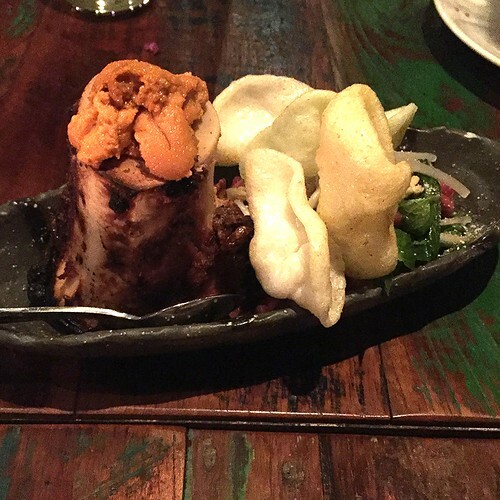 A gout-tastic dish of steak tartare hidden underneath just-fried shrimp chips served with bone marrow and a bunch of uni heaped on top (no big deal). 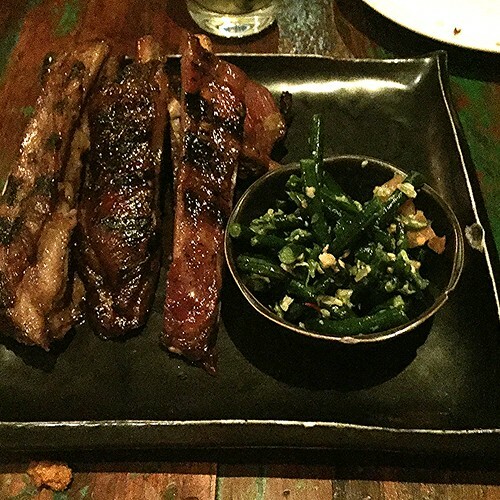 Super succulent, tender and slightly sweet Berkshire pork spare ribs with a smashed long bean salad that I didn’t really care for. 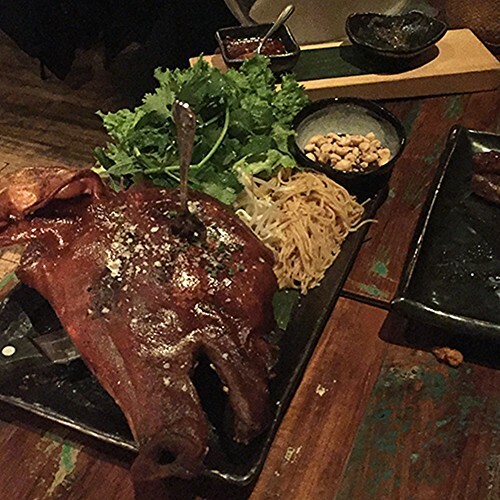 And the day’s special and indisputable show-stopper, half a roasted pig’s head served with accoutrements like herbs, noodle salad and peanuts, all of which you wrap with sauce in rice paper that’s soaked and softened at the table. Unsurprisingly, I was really struggling by the end of this meal and took a painful hour long walk to feel somewhat back to normal. You are currently reading Eats Downtown at Notes on Food.